"I'm the one who's left behind. I'm the one to tell the tale. I knew them both...knew how they lived and how they died." Claire is Ella Grey's best friend. She's there when the whirlwind arrives on the scene: catapulted into a North East landscape of gutted shipyards; of high arched bridges and ancient collapsed mines. She witnesses a love so dramatic it is as if her best friend has been captured and taken from her. But the loss of her friend to the arms of Orpheus is nothing compared to the loss she feels when Ella is taken from the world. This is her story - as she bears witness to a love so complete; so sure, that not even death can prove final. I’m in two minds about A Song for Ella Grey. On one hand, I really dislike it, on the other hand I can see how someone would really like this book. So I’ll try to keep an open mind as I write this. 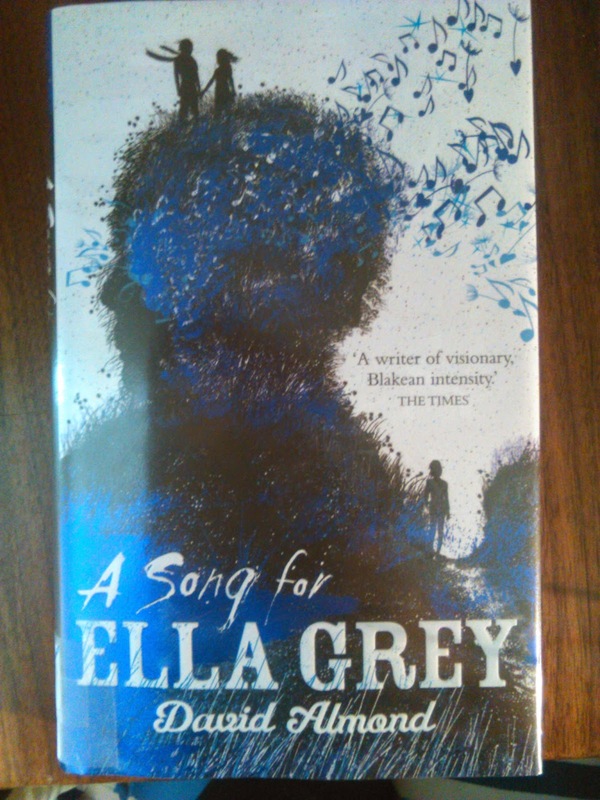 Firstly, A Song for Ella Grey is a modern retelling of the story of Orpheus and Eurydice. Now I wasn’t aware of this until about halfway through the book, and when I did find out, it didn’t really help much because I’d never heard of the original myth. I would advise that you read it before hand if you aren’t familiar with the story, because it made a lot more sense once I understood where Almond was going with it. I couldn’t believe the characters as real teenagers. They were ridiculous and nonsensical even compared to other contemporary YA teens in love, but if you consider them as characters from an epic greek poem, they actually make a lot more sense. The book is pervaded by a fairytale-like atmosphere, which is quite disorienting and confusing, but very powerful when contrasted with the gritty, contemporary setting. In fact the language of the whole book made me feel like I was reading a really long poem. I see why the author wrote it this way, harking back to the old greek poems, but it didn’t really do anything for me. This is a completely subjective critique, if you’re into that kind of poetic, flowery, overwritten kind of language go for it , this book is for you. The narrative of the book, stays pretty true to the story of Orpheus and Eurydice, with the added character of Claire, which is where the story begins to differ. Now correct me if I’m wrong, but I’m pretty sure that Claire considers Ella more than a friend. She’s definitely in love with her , right? Almond never actually states this, but if he didn’t intend it, I’m not sure if he understands platonic female friendship. By the end if the story I felt really sorry for Claire, because Ella clearly didn’t reciprocate these feelings and had no idea.Ella is a kind of manic-pixie-dream girl, and seems to be vibrant and full of life compared to her dull parents, the Greys. They have a lot of hopes and dreams for her, which Ella doesn’t completely agree with, because she considers herself a bit of a fairy-child. My favourite aspect of the book was the beautiful descriptions of the Northumberland countryside and seaside. They reminded me so much of the place I grew up in, the beautiful yet cold and harsh sea and landscape, and brought back so many good memories. The plot was also fantastic, and I couldn’t put it down it was so captivating. While I didn’t love this book, I recognise that it is really good for what it is. It’s a quick read with an excellent plot. And if you’re into poetry, this is definitely for you.